RizomUV Virtual Spaces takes back all this background and comes with major improvements. As strong as a streamroller, but precise like a Swiss watchmaker. 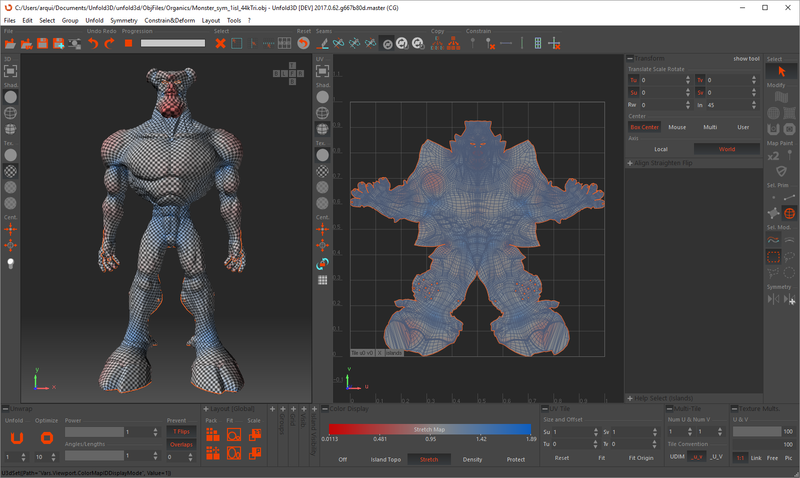 In a few seconds, Unfold turn’s your hundred thousand polygons 3D mesh into a stretch-free and overlap-free flattened UV version. Pack finds the best place, orientation and scale for your islands. Millions of combinations are tested so that the wasted space is minimized. RizomUV's Pack impresses by its efficiency, it can pack island groups, around locked islands and inside island’s holes. 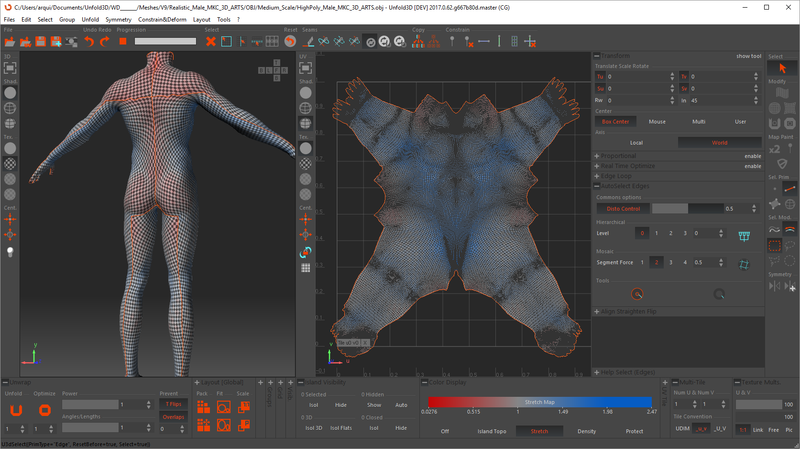 Create seams automatically using specific algorithms designed for characters, manufactured objects, trees and large terrains. Only one mouse click and your model will be smartly segmented into several islands. 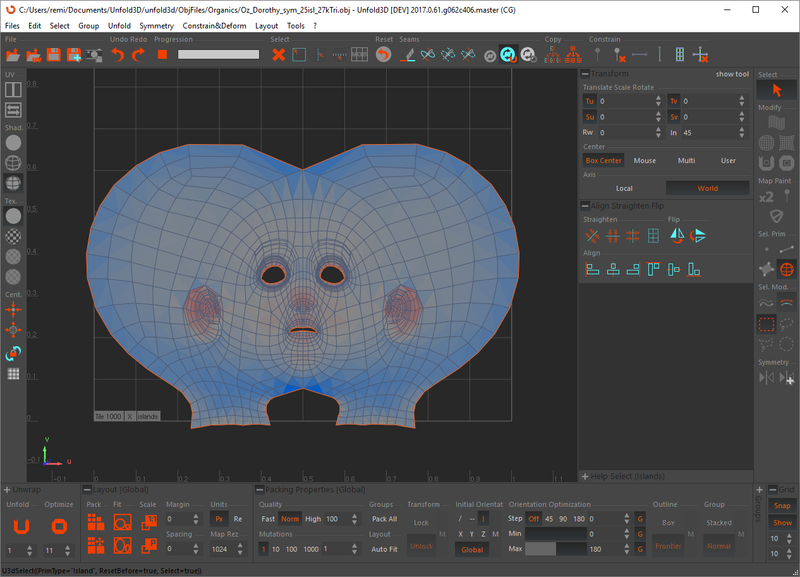 Load and save OBJ and FBX files with poly-materials, poly-groups and smoothing groups. Integrate seamlessly RizomUV into your workflows using the LUA scripting feature to automatize almost everything. Optimize is a stretch reducer. It is so precise that engineers from the CAD world use it to design real objects with micrometer precision. 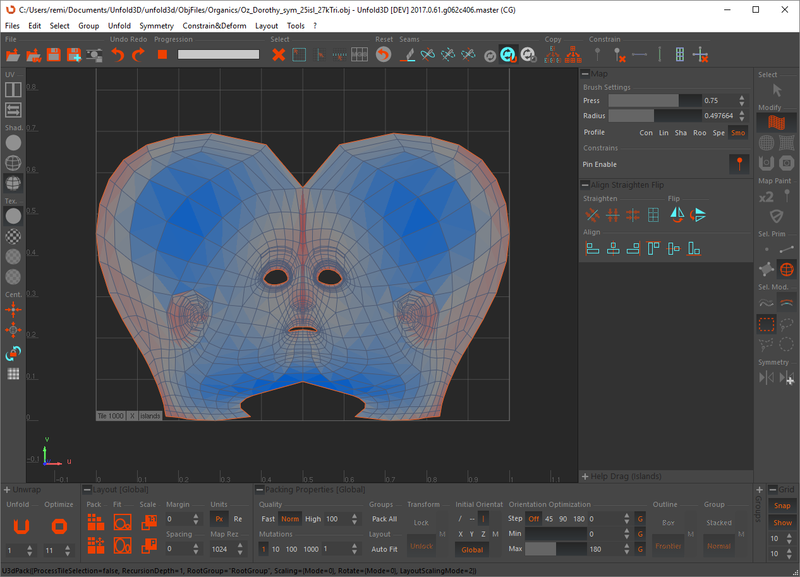 If symmetry is enabled, and if your model is symmetric, the generated seam network will also be. This character model has been cut in a single mouse click using the new Hierarchical Autoseams feature. This feature, looks for the simpler seam line network that open your mesh without segmenting it into several separated parts. After being unfolded, you’ll get the well-known flattened shape like the one below. 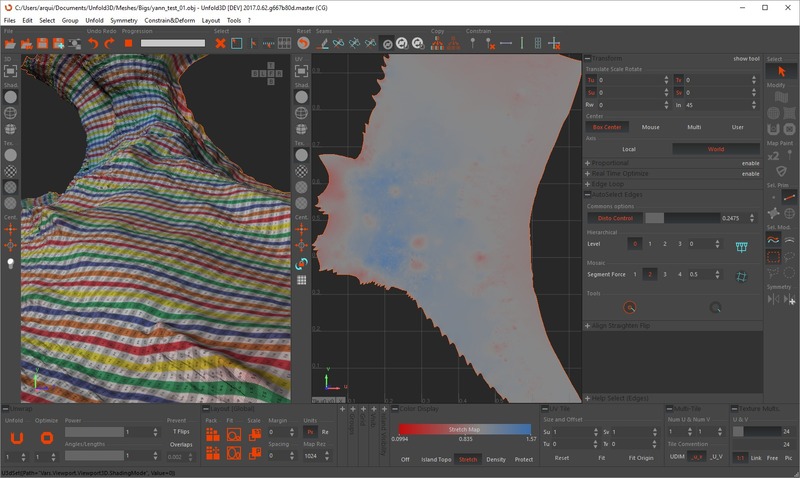 This mesh has been automatically segmented the new Mosaïc Autoseams feature. 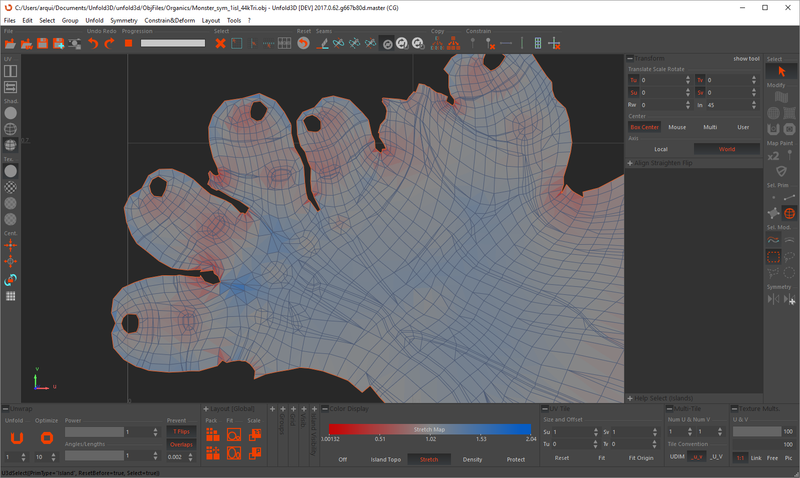 In one mouse click, Mosaïc will look for developpable surfaces of your mesh then create new islands. When enabled, the Disto Control feature evaluates the distortion created by the current seams and adds some cut if the distorsion is beyond an acceptable level.  The Disto Control slider allows to define the value of that acceptable level. RizomUV can pack a massive mesh – like this one clocking in at 80000+ islands and over 700k polygons – Fast. How fast? How does packing this in under 15 seconds on an average workstation sound? Also note that RizomUV utilises UV space to its fullest, using gaps as well as concave areas for packing smaller islands. 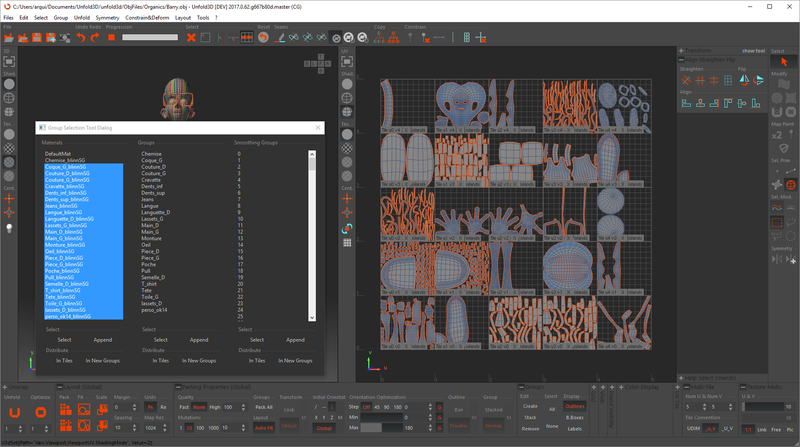 RizomUV can create groups using model’s materials ID (or even smoothing groups). Pack will take account those groups and place them tightly in UV space. Of course, islands groups can be defined from your islands selection and each of them can have specific packing properties such as boxed, locked or unlocked, stacked, mutation count, and many others. Select material’s poly groups then Pack will distribute the groups inside availables (unlocked or selected) UDim tiles. Pack can place islands around locked islands. Select some islands, lock them, then update your packing. Pack will find the best placement of your islands around locked ones. 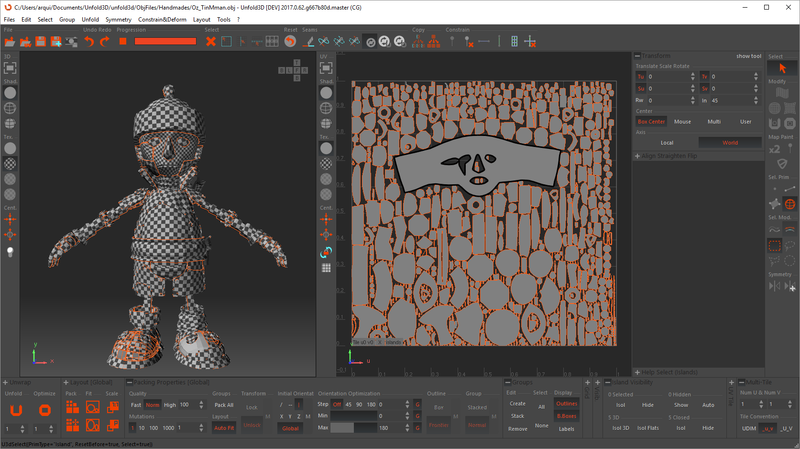 RizomUV Virtual Spaces loads and saves OBJ and FBX files. 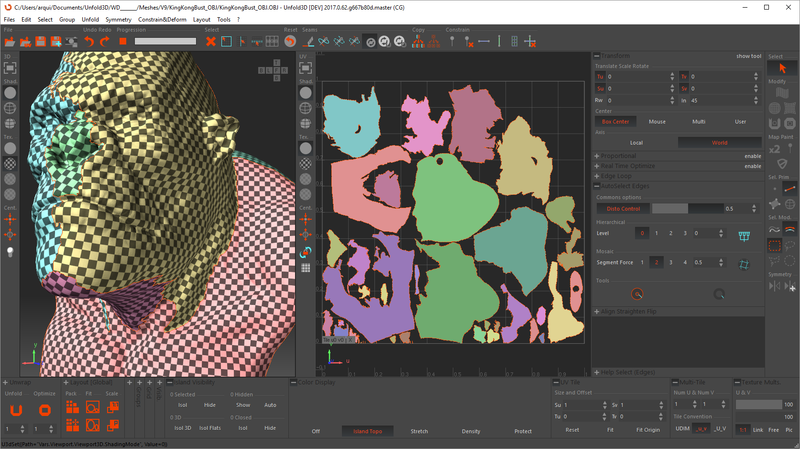 Your model’s Material, Smoothing and Polygon Groups will load, so you can use them for your mapping, and they will export out again as well. To improve RizomUV’s studio pipeline integrations as well as your own workflow, you can write custom Lua scripts which can control RizomUV from any other application, or even from a simple text editor, thanks to the script monitoring feature. 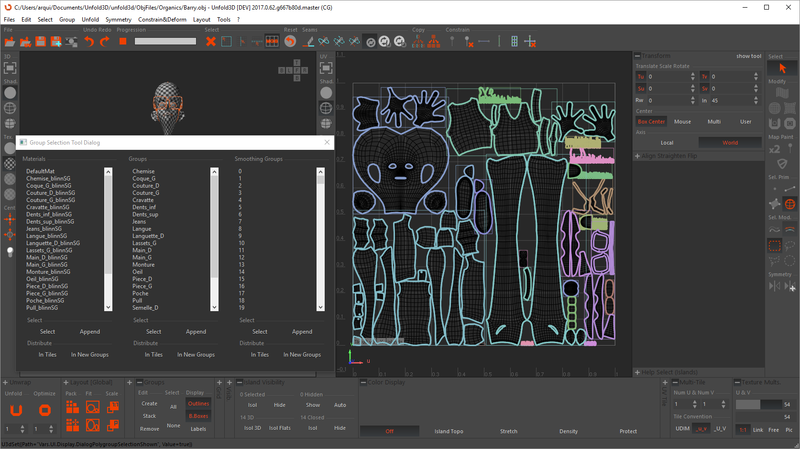 This makes it super easy to integrate RizomUV into your favorite 3D application, as well as customising buttons and features to load and save, like Autoseams, Unfolding and Packing to automate your unwrapping process even further. 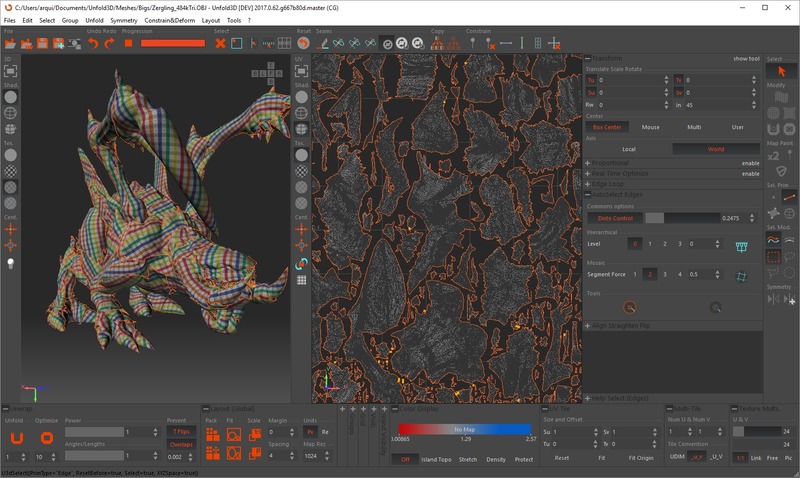 Like most of RizomUV’s features, Optimize can be applied on island, vertex and polygon selections, or by using a fully customisable brush.